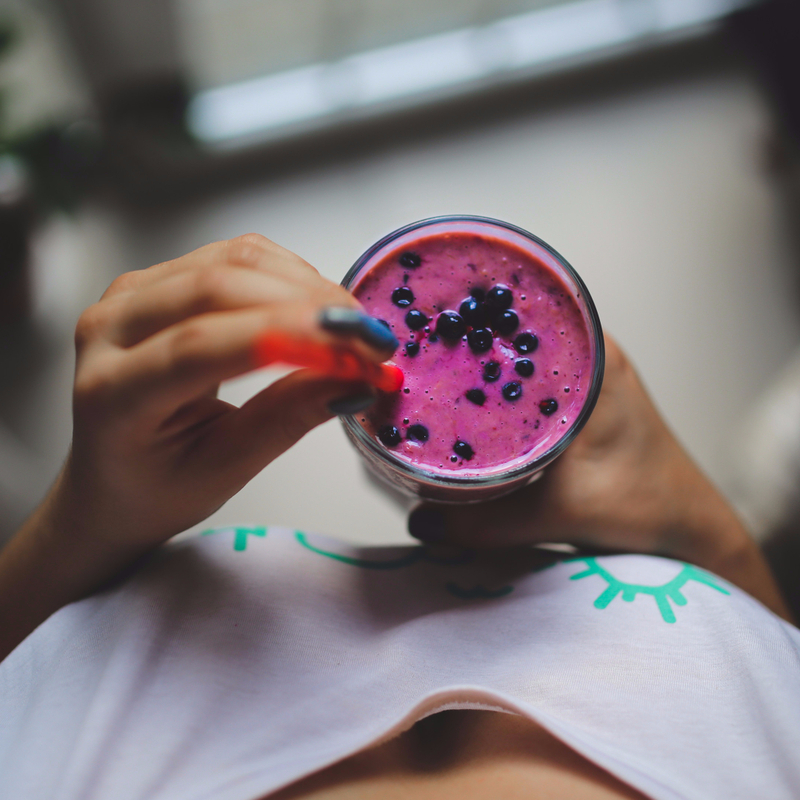 Perhaps you juice, eat lots of superfoods, and sweat out all the toxins. But what about your emotions? Do you make sure to detox them regularly? I’ll admit, I often neglect the emotional aspect of detoxification. Probably because my education is around diet. But emotions can build up and become as toxic as any physical chemical. A case for the emotional detox. An emotional detox isn’t one where you bury all the negative emotions. I’ve done that, and it doesn’t make you feel better. It just makes your brain feel believe it has got a handle of things. Meanwhile, your body is paying the physical price. This happened to me a few years ago when I experienced multiple emotional blows in a short time-frame. I told myself I was handling it. That I was focusing on the positive and keeping myself productively busy. And my brain believed it. But I started experiencing stomach upset soon after. And then my sleep fell apart. And before I knew it, my life was upside down. All while telling myself I was in control. Maybe you’ve experienced something like this. Or maybe your reaction wasn’t as drastic. Perhaps you were just left with a feeling of exhaustion and a lack of vibrancy. Or you just didn’t seem yourself. The point of an emotional detox. The goal of an emotional detox is simple. It’s to let go of the toxic emotions in a way that honors them. It doesn’t mean that you’ll no longer feel the negative emotions. It just means that these emotions will no longer define or control you. This detox is a combination of the things that have worked well for me. And it took some time to develop. The hurt emotions initially seemed too powerful. How often you do an emotional detox is completely up to you. I think once a week is a minimum. But it’s nice to take a few moments everyday to acknowledge your emotions and clear them. And of course, make sure to sign up to talk to a professional when needed. You can’t always heal on your own. 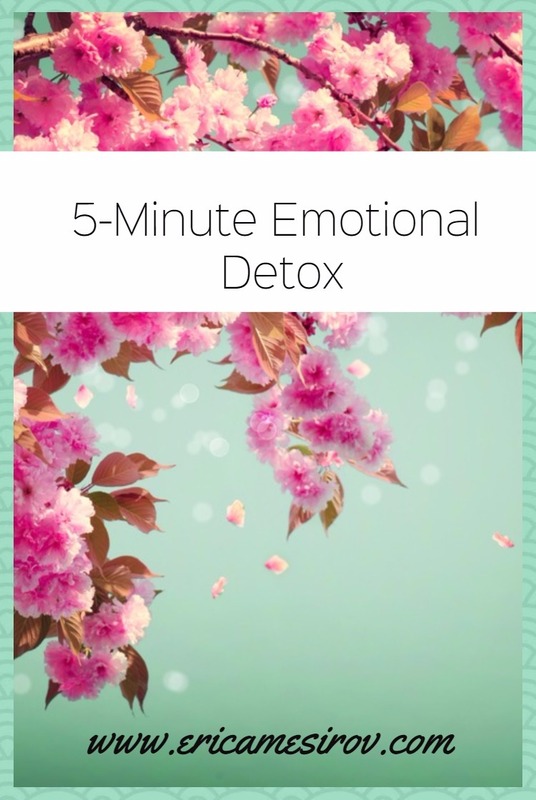 Here’s my favorite 5-minute emotional detox. I strive to do this on a daily basis. It doesn’t always work out, and I try not to get down on myself for it. Bringing in negative emotions would negate the point of an emotional detox, right? Accept your emotions. There’s nothing wrong with anything you feel. Tell yourself you’re entitled to feel. Remind yourself that your emotions don’t define your existence. They are simply your perception of a situation, whether good or bad. While valid, they aren’t an absolute truth. Close your eyes and take 10 breaths in and out. Feel the air entering and leaving your body. You breath is an example of something real. Your breath keeps you alive. Your emotions aren’t your life. On the last breath, release your grip on the negative emotions Let go of holding on to them so tightly. Let them be free. Stretch your body, Move through any place that feels tense. Part of an emotional detox is letting go of stored emotions in the body. There’s so much you can’t control in life.. And you certainly will never be able to control others. But there’s one thing that is under your control. And that is the power you give your emotions over your life. You must acknowledge your emotions. Otherwise, you’re giving them the power to hurt you. But you also need to put them in their place. They’re part of your existence, but they don’t define you. 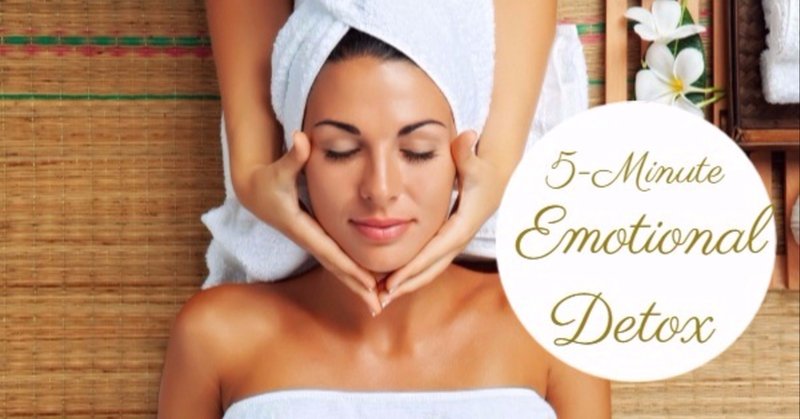 Do you have a favorite way to emotionally detox? Is this something you’ve considered before? Do you feel like you take the time to fully acknowledge what you’re feeling in a day. Let me know in the comments below! Acknowledging your emotions is so not easy. But it makes all the difference in the world, once I can understand what’s happening in my brain it makes it so much easier to deal with the situation. This sounds like an amazing exercise and one we all should be trying or a similar detox. It is sometimes hard to pinpoint the negative emotion though so finding this is key. Oh my gosh, I love this idea. So true! We detoxify our bodies, but don’t think about our soul and minds. I’m going to try this at lunch time. This is a great little emotional detox. I find myself needing this now more than I ever have. Maybe it’s the season of life we are in mixed with the holidays, but I am gonna sit down and do this later. Most people wouldn’t ever think of detoxing emotionally, but it’s certainly necessary in any situation! I only became aware of the mind/body connection surround this in 2011. Acknowledging and allowing ourselves to actually FEEL emotion can be difficult, but I think you’re right when you say it’s the only way to let it go. Great post! This is so powerful, people dont think emotions affect them but they do and can be quite toxic so its lovely to read your post addressing the issues and sharing to others how you are able to help them. This is a great way to detox emotionally. This also hits close to home as I have noticed lately that I need to detox myself. It is difficult to accept ones emotions. It is important, so, taking the time to work on accepting them is a good step. This is also a great way to reduce your stress! I think it’s really important that we go through an emotional detox, especially if we’re going through so much in life right now. Believe it or not I actually learned how to emotionally detox when I attended a Yoga retreat. One of courses they taught was meditation…and that’s what it does…emotionally detox you. It is invigorating! I have never really thought about an emotional detox before. I’m usually pretty good about identifying my emotions and usually what’s causing them, though. I’ll have to start doing something like this, because I agree~~burying emotions can be really bad! These are all really great tips. It is important that we make sure that we acknowledge our emotions. Hmmm I have never heard of or thought of an emotional detox. This would be so helpful. I will have to try it. Mindful breathing is so important. Sometimes I notice I am feeling tense and then I do some conscious breaths in and out and seriously my body, especially my stomach, feels so much better. This past year has been a difficult one so I could definitely use a reminder to detox emotionally. I’m usually pretty good at taking the time to acknowledge my emotions, accept them, and move past the issue, but sometimes it isn’t so easy, especially when things happen that really are beyond your control. You are right, I can’t control other people but I have the power to control the emotions over my life and this is a really powerful thing. I will try to do this 5-minute emotional detox once a week from now, it seems like a great stress reliever. This is really great advice. I’ve had anxiety for years and am determined to handle it without medication. So deep breathing and meditation really make a difference. This is a great idea. I can work the same bad situation over and over in my mind for way too long. This could help me move past things faster. I love your “create your own” paragraph–you are so very right, Erica. I’ve never thought about the idea of emotionally detoxing, but I like it. For months I’ve been doing a few minutes of plank–to stretch from head to toe–and downward dog to stretch my back out. I love those deep morning breaths! This is such a great idea for the busy holiday season. So much is out there to add stress and it’s not healthy to let it all boil over. This worst time of life was six years ago when I had a late miscarriage and my grandmother passed away two weeks later – definitely challenging.